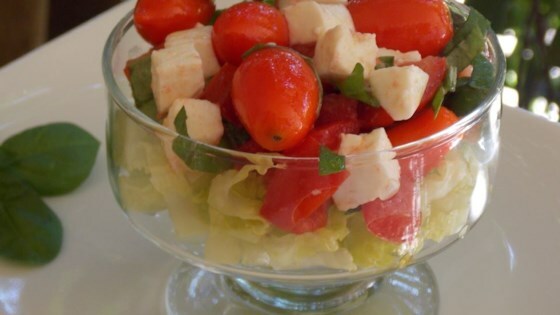 "This light, fresh salad is made with fresh mozzarella, cherry tomatoes, and fresh basil. It is the perfect quick and easy accompaniment to any summer meal." Toss together the mozzarella, cherry tomatoes, basil, and olive oil in a large bowl. Season with salt and pepper. I made this for lunch today. Heaven in a bowl. NOTE: Honestly, I ate half as is and half with a small amount of quality balsamic drizzled over the top. Even more delicious. Lovely! I made these into little kabobs. Placed on a plate, drizzled a bit of olive oil & balsamic vinegar & then sprinkled the basil on top. Everyone loved them. Love Caprese! I served this salad in a small dessert dish with shredded romaine on the bottom and the Caprese Salad on top. A splash of white balsamic would be great with this. Followed the recipe and added fresh avocado chunks. yum! My kids and hubby liked it. :) Now that I think about it, some black olives would have been good too. So good and so easy. Beautiful presentation for your table.